Demolition happens. Sometimes it’s first on the list. The simple fact that somebody had to make a list however means demolition services are never the very first thing that Eastview Homes does for homeowners. First, we like to do onsite inspections, and then we draft base schematics which lead to proper blueprints as architects and engineers weigh in to validate our plans. And it’s only after we have a solid design, and once everyone has signed off on the project that construction can begin, with demolition. Eastview Homes at work improving residential properties in Burlington Ontario – this renovation starts with a comprehensive demolition of the home’s existing interior walls and ceilings. 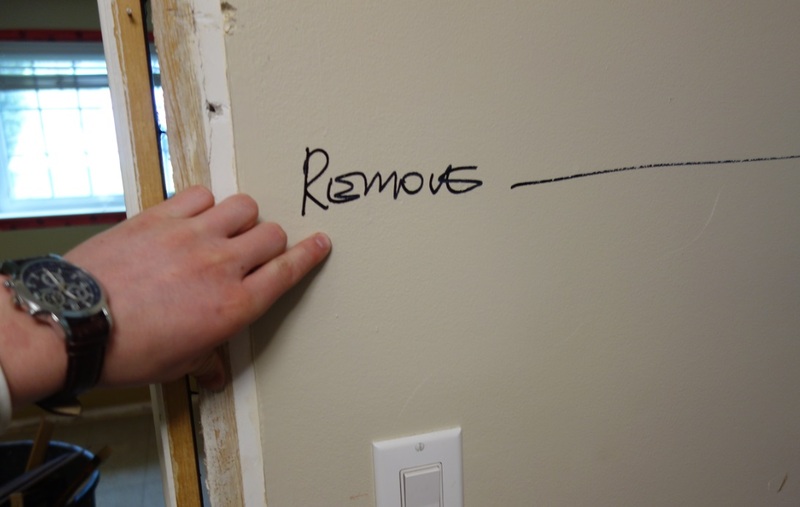 Because many property owners have trouble watching strangers demolish parts of their home, we like to have everything written down and double-checked well in advance before our wedges and sledges hit the drywall. 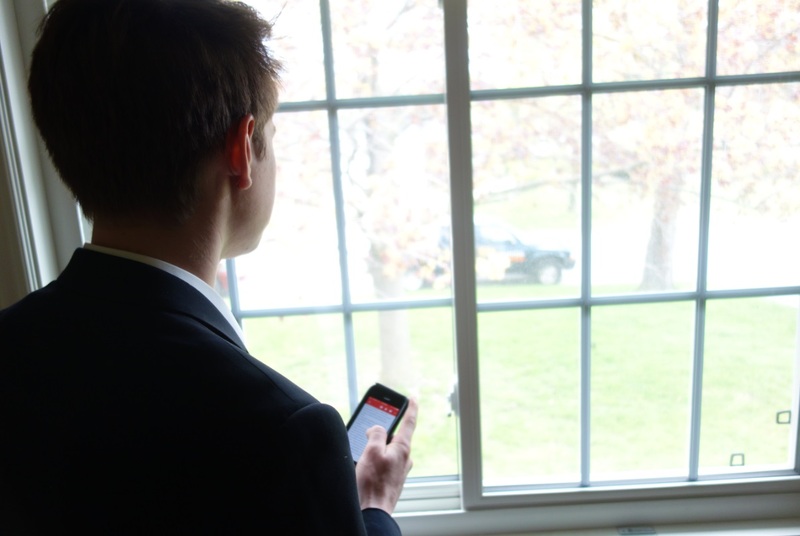 The noise and commotion ALWAYS stirs up anxiety in homeowners and invokes mixed emotions to say the least. Big visual changes cause every property owner to question their bold decision to renovate. 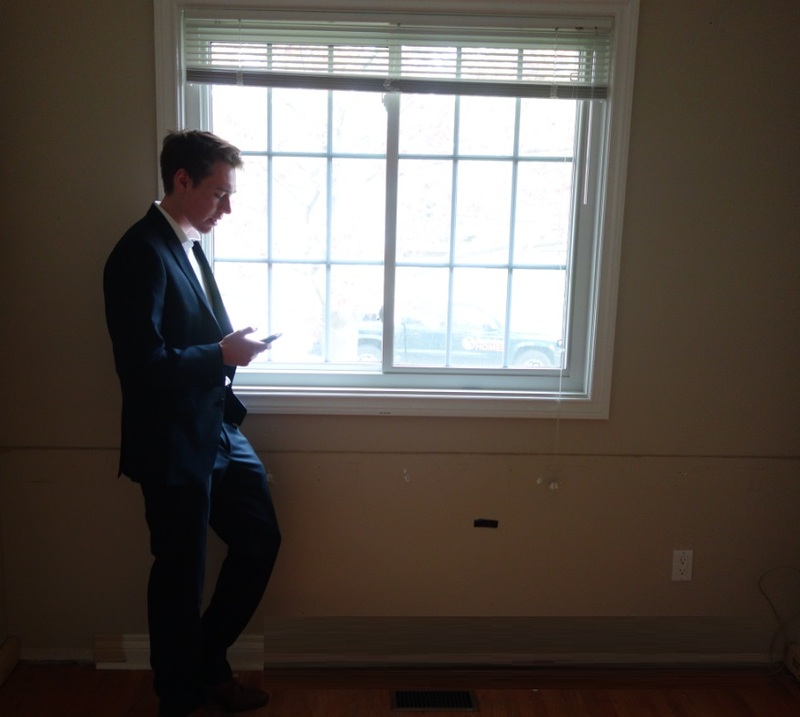 Anxious young homeowner stands in his bedroom window and texts pictures of the demolition to childhood friends he grew up with in the neighbourhood. What’s Involved in a Residential Demotion Job? After getting the go-ahead from the homeowners, we seek out the necessary permissions we need from the government, in this case the local building department. To get the paperwork in order we’re provided with a short list of requirements needed to make the property safe. Its only after these permits are secured, and all the required items have been sourced and brought to the site that we can start work on the property. On site, demolition contractors must clearly display the building permit, and erect safety fencing securing any outdoor portions of the site and thereby prevent pedestrians from walking into the area, and we make tree hoarding / protections. Also required on premises is a fire extinguisher and a First Aid kit. 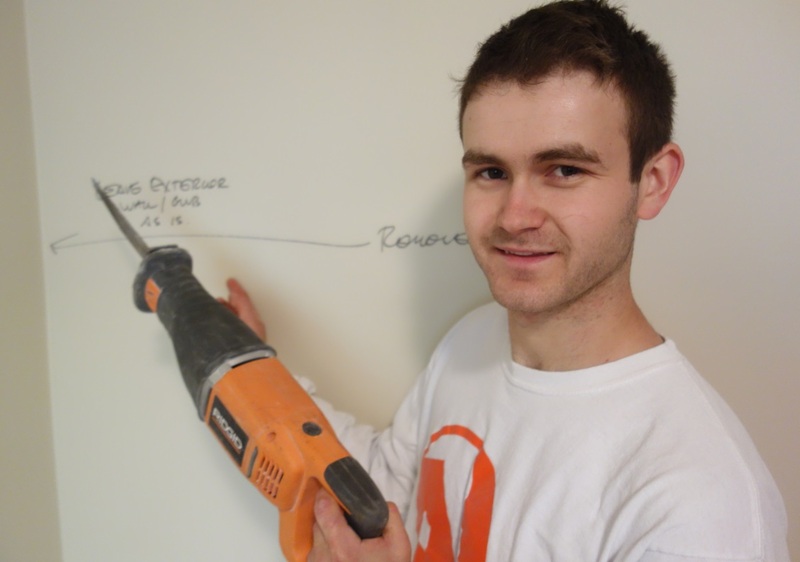 Homeowner points at site manager’s notes – Remove this wall! And bring your ear plugs! 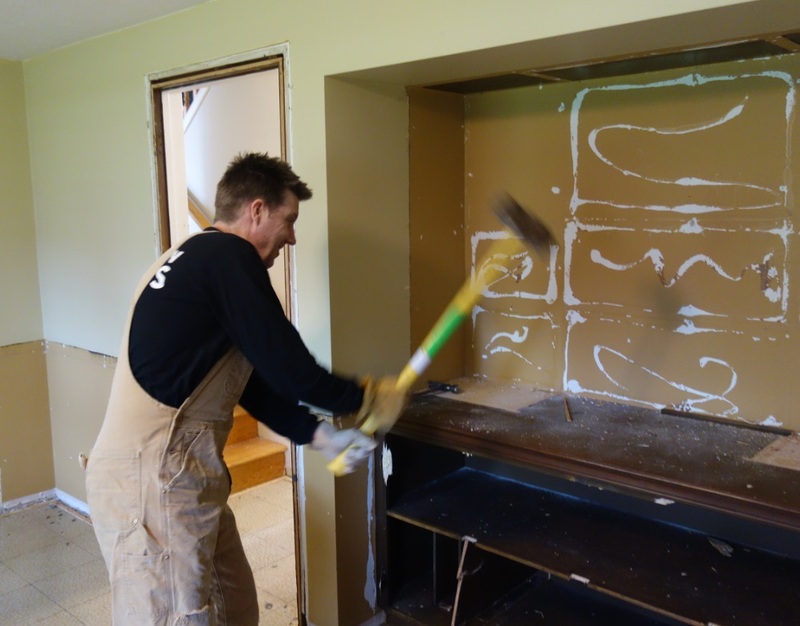 Demolition contractor at work removing shelves from a home entertainment center in the basement living room. The disposal bins were ordered from a local waste management company that pays premiums for metal scrap and tries its best to recycle wood. The project manager has ‘red lined’ the site drawings with details of the selected items, walls, trim, flooring to be removed in preparation for the reconstruction. In this demolition all the bedrooms and even some ceilings and floors are to be removed. If the workers follow the red line code, then bins will be filled more ‘logistically’ by the types of material they contain. 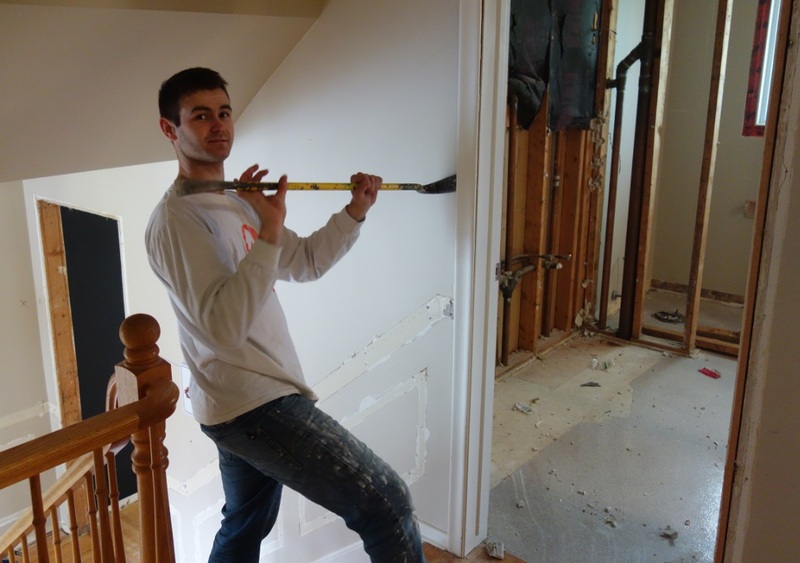 A building contractor doing demolition, seen here removing trim from around bathroom door, before rebuilding interior of a residential home in Burlington Ontario. The house is be completely ‘gutted’ as the plans call for re-insulating the exterior walls. This home was built in the early 1960’s and has minimal insulation and no vapour barrier. Let’s get physical. 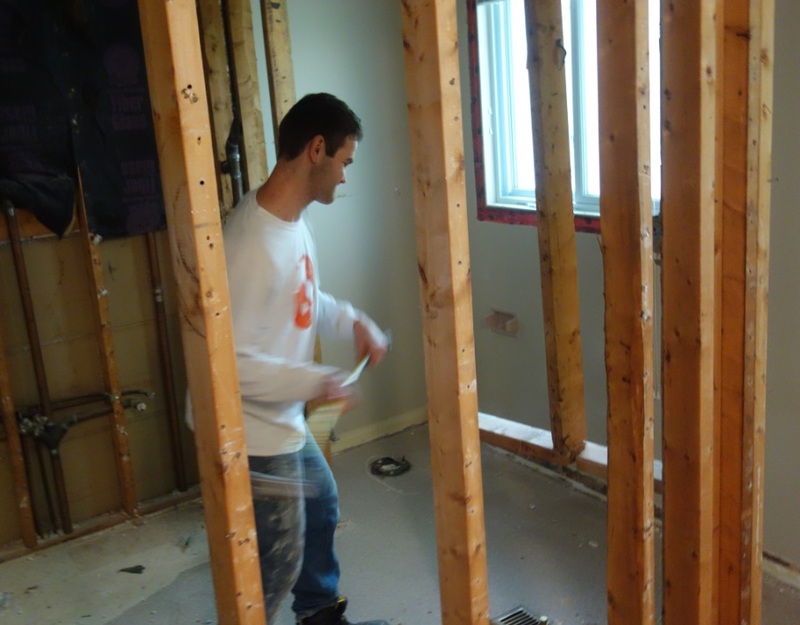 Eastview Homes construction worker demolishes non load-bearing walls, removing 2×4 studs in the master bedroom and bathroom of the home. That means the walls in this house had only an R-8 value with R-15 in the attic! The new building code by contrast requires all exterior walls have a R24 rating, and builders today must strive for an R-50 for all attic spaces alongside the necessary air baffles to encourage a consistent air movement throughout the space and thus discourage moisture build-ups which might bring mold and mildew. When starting any demolition its important to be aware of and to adopt the Workplace and Safety minimum requirements for reducing opportunity of injury; we wear CSA – approved steel toe work boots, safety glasses, and good work gloves and hardhats. The workers in the pictures you see here all have this protective gear and do wear the necessary equipment, except when posing for pictures for the website blog, sadly. 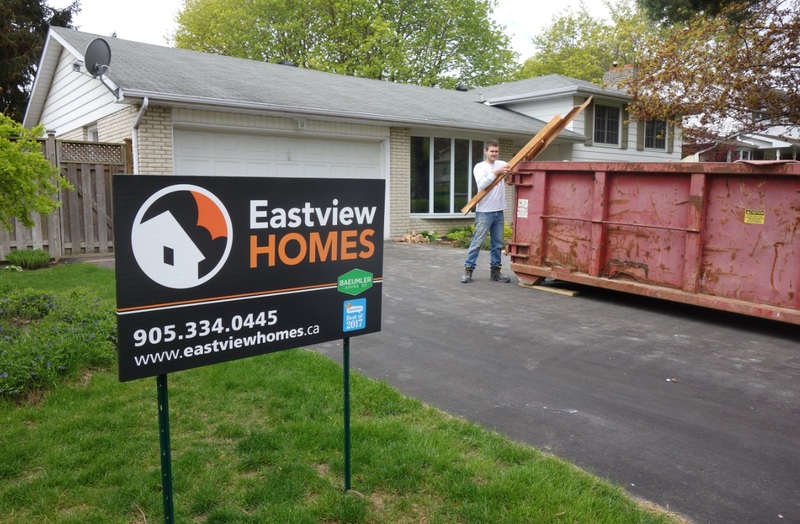 Eastview Homes demolition contractors remove material to disposal bins on site. Prior to commencing each contract we ensure all natural gas appliances and utility mains have been disconnected. We always try to shut off the main supply of course (usually located in the furnace room or directly on the appliance) and I have funny stories about that too, but that’s another blog post. salvaging for reuse or sale. As mentioned above the bins outside will be filled logically. Any items identified as recyclable (steel, copper, aluminum, appliances) get put aside for the scrapers. Once the owners have removed all of their personal items including furniture, art work, and the like, then we get logistical about removing what remains. Interestingly even when a house looks completely clean there are still plenty of knickknacks that fall from closet shelves and attic crawl-ways. The history of the house is revealed as every family that lived there probably lost something in one crevice or another. Our site manager likes to start ‘cleaning’ the home as he says, by removing any fixed fixtures, hanging lights, and replacing all ceiling lights with safety work lights. Next he removes mirrors, towel bars, handrails and fireplace grates etc also get removed. All metal items or even nice vintage wood being salvaged gets put aside in a special smaller bin located on site for such items. Next comes the removal of all fixed furnishings’s like wall cabinets, trim, curtain rods, build in shelves etc and these items, although reasonably light in weight take up much of the space in the first disposal bin. Demolition contractor follows set instructions regarding when walls are to be removed so as to sequentially stack bins with salvageable materials on site. From there we’re ready to start the heavy and labour intensive task of removing the plaster walls and ceiling. If this author had dropped by the house at that time I’d have have seen everyone wearing CSA approved dust masks. 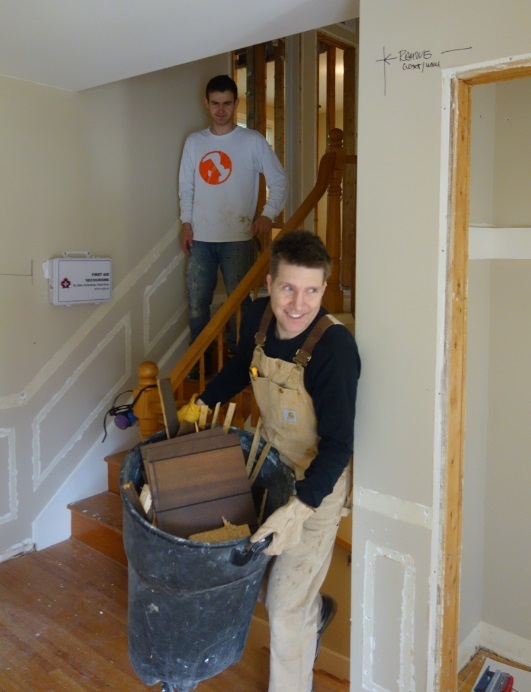 This is also the day we hire the most workers – to get this messy job done as quickly as possible it helps to have extra hands on crew to pack the plaster / drywall into the bin. Finally we are ready to review and remove any non load bearing walls. This final stage provides the greatest visual impact for home owners – they see a space they’re so accustomed to being so radically changed. This project in Burlington Ontario, a side split 1960’s home will be receiving a complete make over including a 18 x 20 side addition. The renovated home is to have new insulated windows and doors, designer asphalt shingles, wood siding, and custom wood columns and veneer natural stone. Anxious homeowner focuses on the future of the property as his family home is being transformed around him. The interior will be much more spacious and modern with raised ceilings in the master bedroom and living room. Engineered hardwood floors will cover the majority of the space and will look stunning when all the partition walls are removed. This vision of the future is what calmed the anxious young homeowner that day; he knew he wouldn’t regret changes that double or triple the value of the property.